Kobach was discussing an article he wrote for Breitbart on Wednesday arguing that the “greatest benefit” of Trump’s travel ban from certain Muslim-majority countries is that it includes a suspension of the U.S. refugee resettlement program. Breitbart’s Alex Marlow faulted the Trump White House to some extent for “poor messaging” on the refugee issue that has allowed the media that “seeks to filter and demonize so much of conservative thought and really pro-America thought in a lot of ways” to shape the issue. 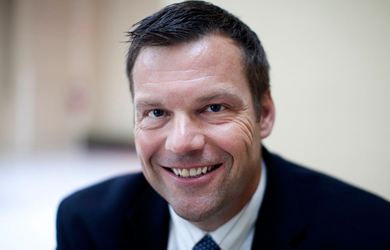 Kobach insisted that when it comes to refugee resettlement and immigration in general, “the facts are on our side,” arguing that “many” refugees will turn to terrorism. In his Breitbart article, Kobach claimed he had found that “at least 30 terrorists have used refugee status (or presence in the United States based on asylum claims) to carry out their terrorist activities in the United States since the 1993 World Trade Center attack.” His count includes people who have made asylum claims—different than the refugee resettlement program—and even the Tsarnaev brothers, who were the children of asylum seekers.